All of these elements go into the songs on 'Pretty Little Town'. From the honky tonk story in "Dark Tavern Blues" to the resurgence of hope in "The Winter of '96", to the joy of rock and roll in "Unsafe At Any Speed" and "Guitar Problem". 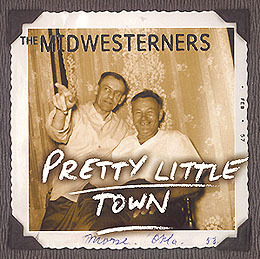 Everyday life, salt of the earth characters, journeyman musicianship, and a pinch of humor are the elements for The Midwesterners' "Pretty Little Town." and the steel guitar was done by Frank Anderson. Released in 2001 this is the Midwesterners sophmore offering. Maximum Ink, Dave Luecinger---- "the group has remained true to form, a bit each of Dave Edmunds, Webb Wilder, and Chris Isaac winding through descriptive and often autobiographical lyrics."